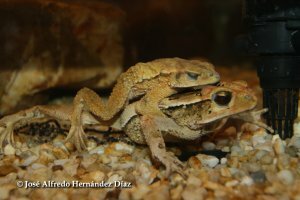 Africam Safari in Puebla, Mexico, has established a captive breeding program for the Critically Endangered Large-crested Toad, Incilius cristatus. This program resulted in successful breeding for the first time in December 2012 and again in March 2013, and in July this year, some of the offspring from the first clutch were released into the wild by local schoolchildren from the Xocoyolo community. Education staff from Africam Safari taught the children about the importance of amphibians as environmental indicators, the importance of rivers and forests and the actions the children can take to protect their environment, before the children released the frogs. Donations to this project will help with field staff and supplies for testing animals in the wild for chytrid fungus, and for ongoing support of the breeding animals at Africam Safari. Please also include an email address or postal address if you would like us to mail an attractive donor card to the honoree. Would you like us to include a message from you? If your donation is associated with a particular event (e.g. a school fund-raiser, reptile and amphibian event or show etc. ), please let us know which event. Payment for your donation can be made via PayPal, credit card or check. To pay with your credit card, click the Don't have a PayPal account? link on the Payment page, and enter your credit card details. *The Amphibian Ark is a USA 501(c)(3) charity (TIN 46-1453272). Donations made to the Amphibian Ark may be tax deductible for U.S. tax payers.